Select the voucher amount you wish to purchase. When proceeding through check out type in the delivery address of recipient if different from your billing address. You can also write a message to the recipient in the 'comments about your order' box and state the day you would like the voucher to arrive on. If there is a problem with your order you will be contacted by E-mail. Your gift voucher will have a voucher code number. Once you have selected the desired item you wish to purchase from Miss Lontay proceed to check and enter the voucher code number in the 'Enter Redeem Code' box, the amount will be deducted from your total bill. Orders can be paid for in . by selecting the currency box in check out. 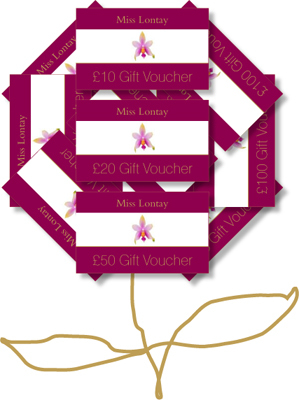 Miss Lontay's Gift Vouchers are guaranteed to solve all your gift giving dilemmas.